They had lots of honey with shaker on the shelf, honey by itself and chocolate all for £0.99p for 10 portion tubs. Not sure about taste as I bought just the honey but not tried it yet. Plenty of the honey and honey with shaker at Homebargains , Clifton Moor , York this afternoon . I prefer the chocolate one so took the last 5 of those . Hmm interesting never seen this Yokebe gear before. The missus is a veggie so she will love it! 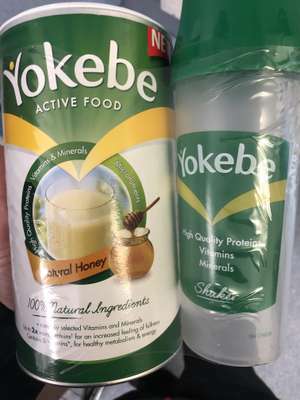 Hmm interesting never seen this Yokebe gear before.The missus is a veggie …Hmm interesting never seen this Yokebe gear before.The missus is a veggie so she will love it!